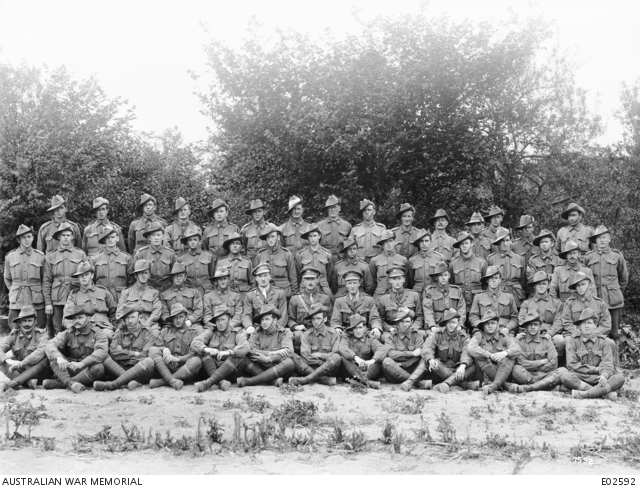 Group portrait of the 5th Light Trench Mortar Battery. Back row, left to right: 5806 Private (Pte) John James Driscoll; 4985 Pte J. Brabston; 1572 Lance Corporal (L Cpl) G. Brennan, times wounded one; 1231 Corporal (Cpl) J. Hare, times wounded three; 4312 L Cpl H. Smith; 6406 Pte Robert Waller; 6406 Pte J. Sullivan, gassed twice; 4183 Pte A. H. Holmstrom; 1655 Pte P. Brady MM, times wounded one; Pte W. Hunt; Pte McDougall; Pte N. Walters, gassed; 2281 Pte G. Saunders, wounded (behind); Pte J. Ellis, wounded; 5088 Pte G. Sandelands. Third row: 3823 Pte W. Kirby; Pte E. Young; 1244 Pte A. McGregor; 2496 Pte E. White, times wounded one; 4593 Pte D. Evans; Pte J. Neighbor; 1673 Pte A. C. Wilson; Pte B. Sivley; 6053 Pte A. Doyle; Pte A. McLean, times wounded one; Pte W. Nixon, times wounded one; 5583 Pte E. Gibbons; 1233 Driver (Dvr) A. Killiby (probably Thomas William Killiby); Pte Alexandra (probably 4744 Pte William Arthur Alexander), died of sickness 26 October 1918, aged 23; Pte R. Crew (forward); Pte J. Underwood. Second row: 2644 Sergeant (Sgt) A. R. Fox MID, times wounded one; 301 Cpl S. Wallace; 1251 Cpl S. Keen MM; 2744 Cpl E. Brodigan, times wounded one; Lieutenant (Lt) Greenwood, shellshock; Lt W. B. Suttor; Capt W. Crisp; Lt Ulric Kerwick Walsh MC; 1692 Sgt J. Foggarty; 514 Sgt W. Crook MM; Cpl W. Grace; Cpl Woodward, times wounded two. Front row: Pte Wilson; Pte C. Wilson; Pte Thomas Travers, killed in action 18 July 1918; Pte Sparkes; Pte Burke, times wounded one; Pte Sheen, times wounded one; Dvr H. Booth; 4684 Pte L. Cormack; 1579 Pte H. Bryant; Dvr J. Ryan; 5436 Pte W. White, times wounded one; 4447 Pte G. Hathaway MSM; Pte Ellesmore, times wounded one.